"Feathering one's nest: Figuratively, to decorate and furnish one's home in style and comfort. (Alludes to birds lining their nests with feathers to make them warm and comfortable.)" 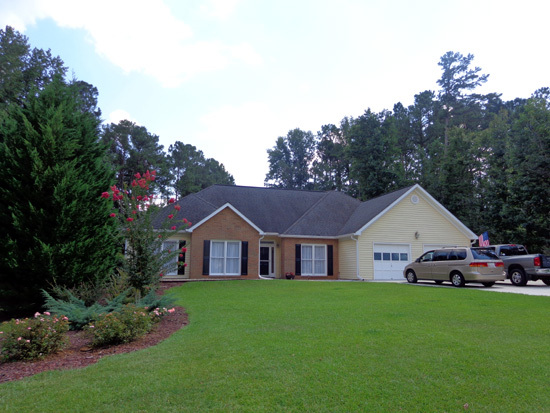 One of the things I looked forward to when we bought our house in Peachtree City in the spring was "making it our own." 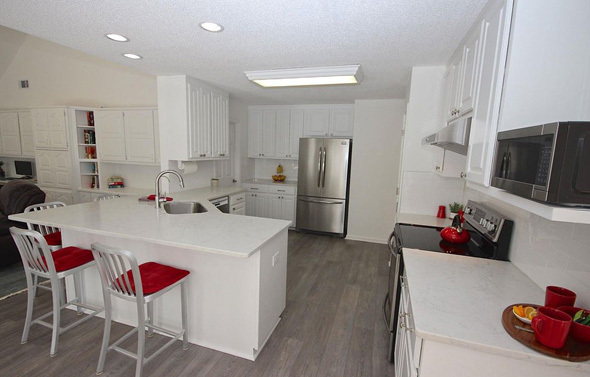 There was little to do inside cosmetically except some painting because the sellers left the house very clean, the hardwood, tile, and luxury vinyl floors were in excellent condition, and the bathrooms and kitchen had been updated recently. 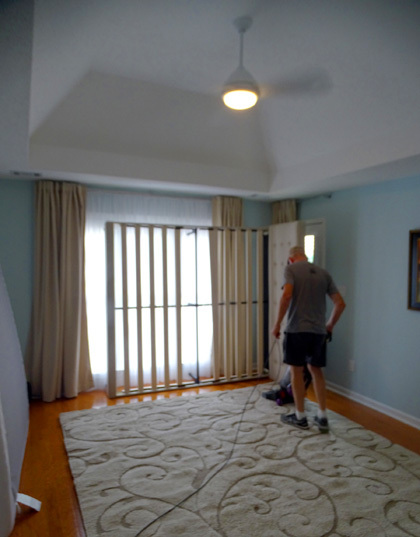 They also left all their window coverings, saving a lot of time and $$$ to not have to purchase those right away. But it still needed to feel like our home. I loved the blank slate and had already been thinking how I wanted it to look before we moved in. 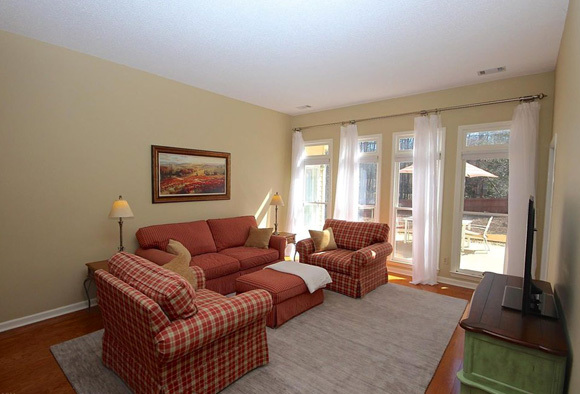 MLS photo of living room; the sellers left us the sofa, chairs, ottoman, and 9x13' wool area rug. We closed at the end of March and stayed in the house a few days before driving up to Roanoke to get the items in our storage unit. Fortunately, we had comfy living room furniture the sellers left for us and a nice new bed we'd already purchased, but little else in the way of furniture the first few days since we were moving from our RV and not from another house. When we sold our house in Virginia three years ago we also sold and gave away much of our furniture. 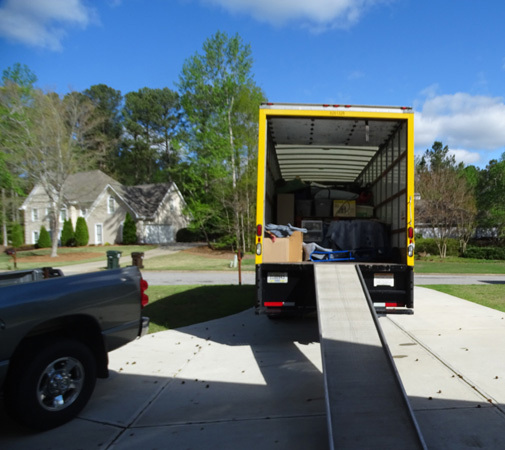 We were tired of some of it and we knew some items, like upholstered furniture and mattresses, wouldn't fare well in storage for an undetermined number of years. 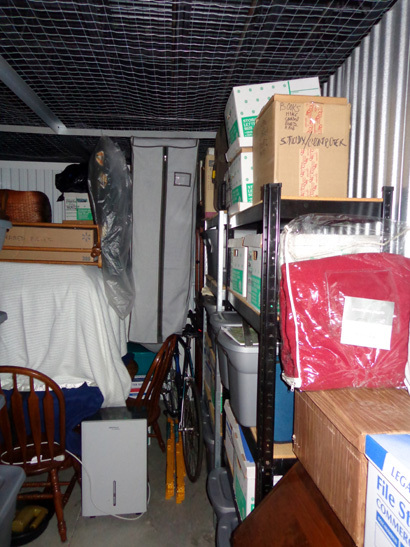 Even though we rented a climate-controlled storage unit it wasn't humidity-controlled. And it's plenty humid in Virginia. Before closing on this house we ordered a king-sized Sealy Cocoon Chill memory foam mattress. One of Jim's sons had recently purchased a Cocoon and loved it. We love ours, too. 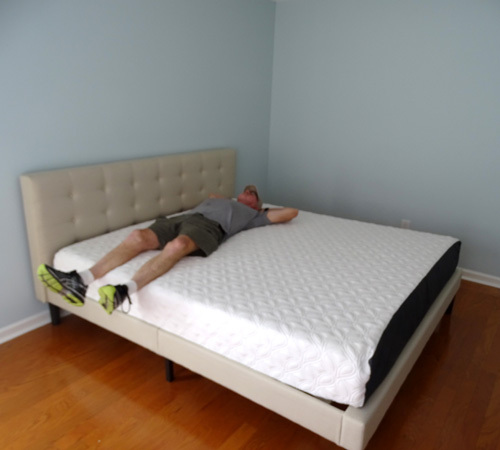 We also ordered a padded linen headboard, bed frame, and new bedding. We had all of this delivered to Kings Bay a few days before we left so we'd have a bed to sleep in our first night in the house. We stored the unopened boxes in the truck and camper until we moved in. It was fun the first day to open that mattress box and watch the foam expand to full size! 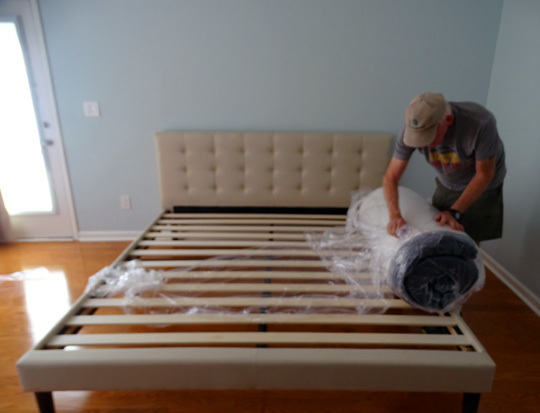 bed frame and fabric headboard we assembled, also purchased online. Ahhh! We slept well that night, the first in our new home. Thank goodness we didn't have to send the mattress back or donate it somewhere (Cocoons are guaranteed for several months). After one of those things expands exponentially, it'd be like putting the genie back in the bottle! Before closing we also bought special stainless steel cookware suitable for our induction stovetop (never had one of those before), a new microwave oven (the sellers wanted theirs), and a washer and dryer so we'd be up and running at the house the first few days. Lowe's delivered the washer and dryer the first full day we were in the house and Jim got them connected. The sellers remodeled the kitchen two or three years ago so the refrigerator, oven/stove, and dishwasher are relatively new. I'm glad we didn't have to buy and install all that, too. the separate dining room. The area by the windows, below, "went to the dogs" after we moved in. All we had to do in the kitchen was figure out where to put all of our equipment and dinnerware when we got it out of storage. 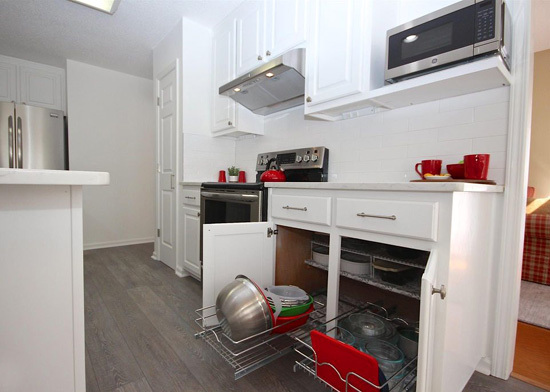 The sellers equipped the soft-close drawers and cupboards with sliding stainless steel racks and other aids to keep everything well organized. 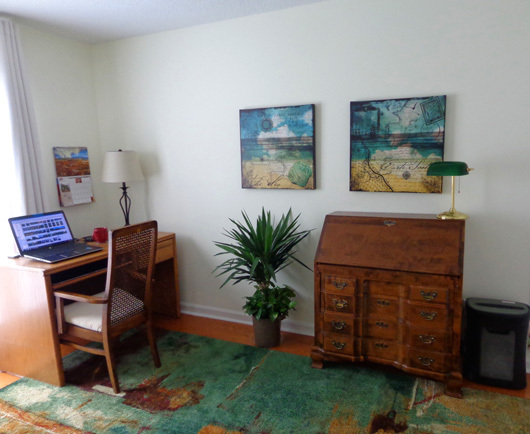 Examples are in the picture directly above, another one of the listing photos. 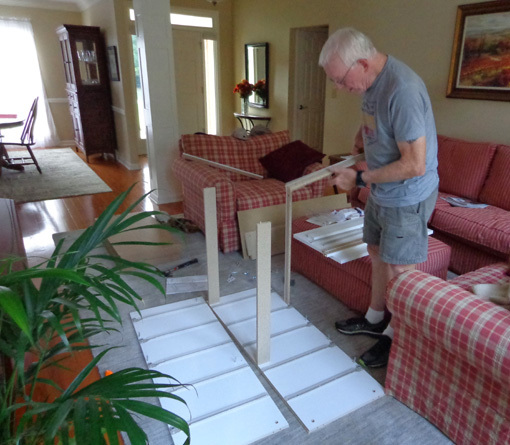 Jim and I are ardent do-it-yourself-ers, doing as much vehicle, home, and yard maintenance as possible, even in our late 60s. It's not just that we want to save money, it's more that we've always done these things and refuse to believe we can't do them any more! I think we're a lot like other Boomers and folks from the Greatest Generation in that regard. We're also pretty sure we can do most of the work better than anyone else; we have pretty high standards. With all that in mind, we decided we'd move our own stuff from our storage unit in Virginia to our new house in Georgia. We knew it would be a strain on our aging bodies. We were right but, in retrospect, we're glad we did it the way we did. Next time we move, hopefully a long time from now, we'll hire help. Or, by then, we can just get rid of everything before we head to the nursing home . 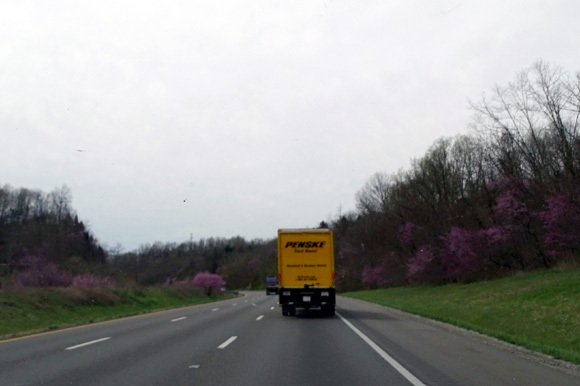 . .
note all the flowering redbud trees lining I-81 a little south of Roanoke. It took us just two days -- long ones -- to get our belongings in Roanoke. We drove up there the first day in time to check into our motel, go across town to get the 26-foot Penske rental truck we reserved from Home Depot, drive back to the storage unit, and begin to organize how we'd pack the truck. 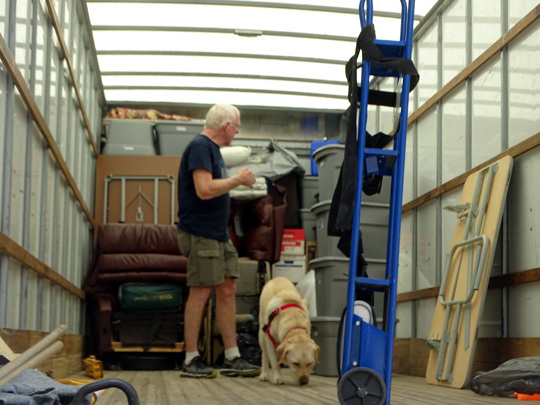 After eye-balling the inside of the truck and all the stuff we had stored in our 10x20-foot storage unit we weren't sure everything would fit into the truck. We moved some things aside that we could leave in Roanoke and either do without or get later and began putting some absolute must-haves and stackable stuff in the truck until it got too dark to work. The next morning we had help from two experienced self-employed movers for about two hours after we'd already packed about half of the items. We left the heaviest items for them. Lo and behold, with their additional padding and straps they were able to stack things up quite high and we ended up with some room to spare in the truck. Whew! Jim drove the truck back to Georgia that afternoon/evening and I followed in the minivan with the dogs. Everything and everyone arrived home safely. We got everything off the truck in a few hours the next morning but paced ourselves unpacking boxes once they were inside the house. We were real glad we sold most of our furniture and got rid of a lot of other things three years ago so we didn't have as much to move this time. Moving was hard on our deteriorating joints but we didn't get hurt. It was nice when we finally got most things organized in the house and garage and we weren't tripping over boxes and plastic totes. Since the house is fairly small and we don't have a basement it was fairly intuitive where to put things so they'd be convenient. Items we seldom use are in the attic, like holiday decorations, some empty boxes, and all the gray plastic totes we used to store things when we were RVing full-time. We don't need a basement, and we vow to never accumulate as many things as before. 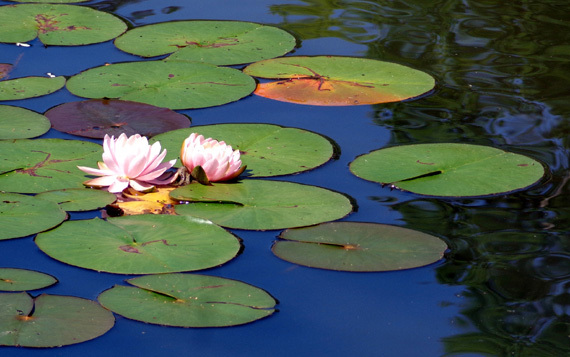 Living in an RV for so long made us realize we simply don't need much to live comfortably. Then the fun part started -- I love to decorate a house! 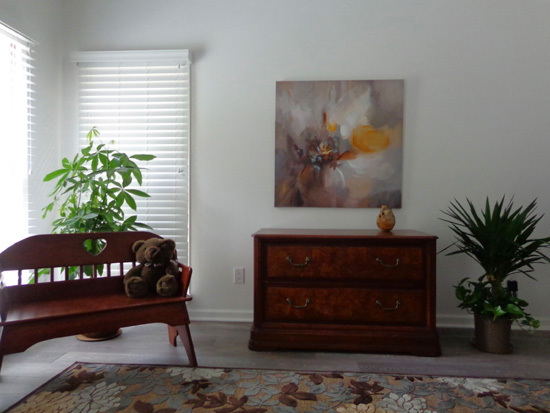 It took me about two months to get it furnished and decorated the way I wanted. We kept some of our newer furniture in storage and can use all of it in this house. But there were still a lot of things we needed to purchase to complete our three-bedroom house with separate living, dining, and family rooms. Home Goods. The canvas art print was on sale at Kirkland's for only $30. Plants are from Home Depot. It would have been faster to "fill in the blanks" with furniture, area rugs, art work, and other household items if we'd been willing to make several trips closer to Atlanta to shop in bigger stores than local businesses like Home Goods, Kirkland's, and BedBath&Beyond. However, we didn't want to hassle with metro traffic. The only furniture store we visited in Atlanta was IKEA, and that was only because we were going up there for a medical appointment nearby. We ordered about half the new furnishings online -- several things from Wayfair.com, as well as chains like BedBath&Beyond, Kirkland's, Sam's Club, Home Depot, Lowe's, and Walmart if they didn't have the items we wanted in local stores -- and had them delivered to our house. We are pleased with the quality and prices of everything we got online. I read reviews thoroughly before ordering anything and submitted some reviews of my own, which I had never done before. We had to move the bed frame and Cocoon mattress to install the rug and pad. I don't know how anything would get done around here without Casey's help! 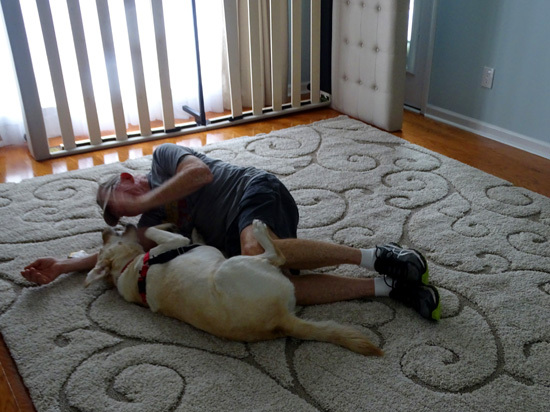 It was more nerve-wracking to me to choose large area rugs online than any of the furniture or art work we ordered without seeing it in person but I was happy with all three rugs we purchased that way. I just couldn't find all I wanted in local stores. After I got done decorating the house (is one ever done decorating a house??) 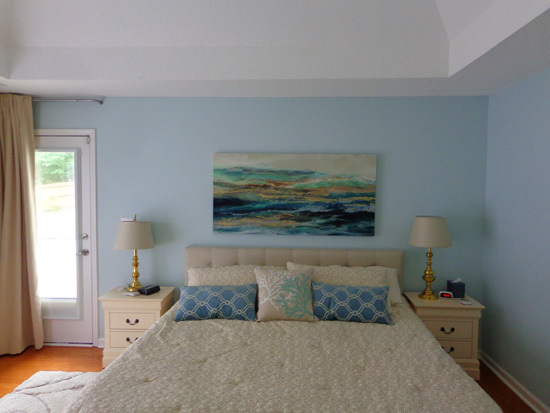 I decided I like the master bedroom the best. I've purchased different lamps with blue bases since taking this picture. 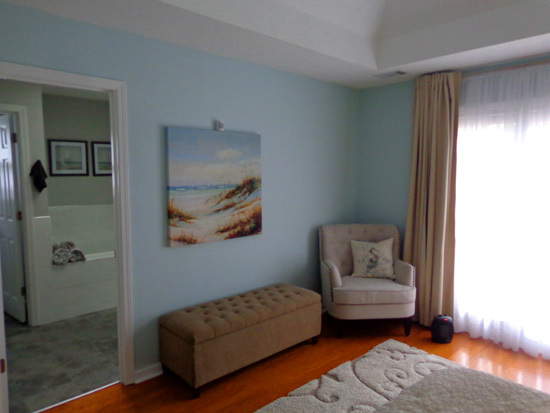 Corner of master bedroom; the pillow has an embroidered blue heron on it. We have herons by the lakes and streams here in Peachtree City, too. I carried a subtle coastal theme into both full bathrooms also. This house is more modern than most others we've had in the past. I've really enjoyed finding more contemporary furnishings than I've had previously. Some of the furniture we sold/gave away three years ago were things I had when I was a kid, or furniture and other household items that belonged to my parents and grandparents. I still appreciate antiques -- but now, only in someone else's house. It's not just Generation Xers and Millennials who like simple, modern furnishings! 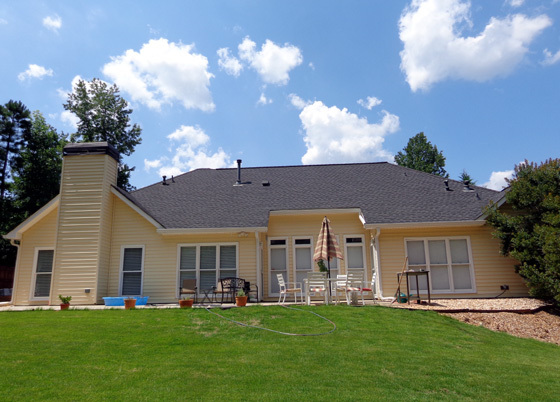 We deliberately bought an updated house because we didn't want to get into any lengthy remodeling projects. So far we've only done a few smaller projects to freshen up the interior of the house or make it more efficient, like painting one bedroom and some woodwork and doors, adding towel racks in the bathrooms, taking out shelves in the laundry room to accommodate our larger washer and dryer, and replacing the vinyl horizontal blinds in the kitchen and family room with Bali honeycomb shades to match the rest of the windows in the house. Since the back of the house faces mostly south, we wanted a cover of some type in the summer to reduce the heat pouring inside and to protect us from the rain when we take the dogs outside. 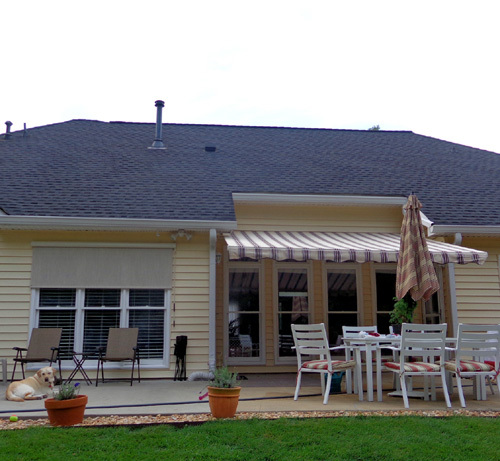 We ordered a wide, motorized SunSetter awning to shade the four tall living room windows. That part of the patio is recessed in sort of an alcove (see photo above). 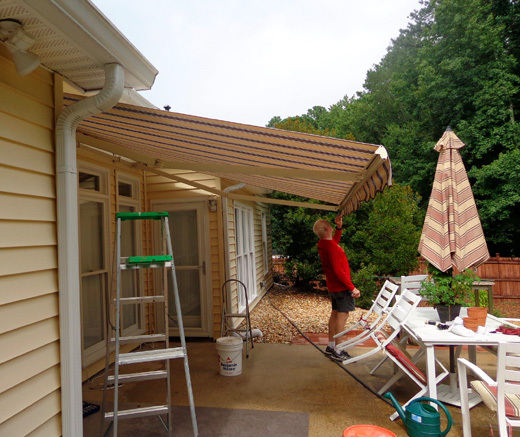 We saved a lot of money by getting a refurbished SunSetter awning -- in the size and colors we wanted and with the same guarantees as a new awning -- and installing it ourselves. It looked brand new when we got it. Jim got some help hoisting it up onto the wall brackets but he did all the other work himself. 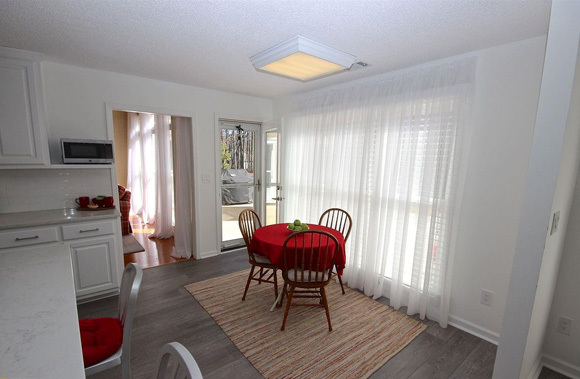 He also installed a reflective manual SunShade by the same company on the outside of the three tall kitchen windows. It's like the windshield covers we've seen on many motorhomes in campgrounds -- you can see out but other people can't easily see inside. Both of these products have made the interior of the house more comfortable this summer and the AC unit doesn't have to work as hard. We've done a lot since we moved into this house. We have a few more ideas for the near and distant future. None of it is pressing, so we're mostly just enjoying our new home and neighborhood. After living here for six months (I mentioned I'm updating this in October), we have no regrets so far about moving here. It's been fun to get settled into our new community. We still have no travel plans. Someday we'll get the travel bug again and be excited about wherever it is we're going. Meanwhile, we're happily "nesting" in Peachtree City.